When Natalie Feulner of Cal State East Bay Magazine profiled Liz Cocker, she titled the profile "Driven." Cocker, a native of Rancho Cordova, California, began swimming competitively when she was 7, and by the time she was 12, was "winning every race she participated in." She has continued competing, practicing, honing her skills, and breaking records. Her story is a familiar one. As she told Feulner, "I was born deaf, and when I was 16 months old, doctors told my parents I'd never read or talk above a third-grade level and would be at a disadvantage when playing sports. Luckily, they didn't listen." Cocker had an oral-mainstreamed upbringing, received her first cochlear implant when she was 5, and opted for a second CI when she was a high-school sophomore. She attended CCHAT, a mainstream high school, American River College, and continued her competitive-swimming career at California State University, East Bay. During her freshman year in college, she began learning ASL, her "first contact with the 100% Deaf community." She excels at the butterfly stroke, considered the most challenging and demanding stroke. She told Feulner, Not a lot of swimmers do fly; there's a rhythm you have to learn and it takes a lot of strength, but I always liked it. All of a sudden, I started winning and getting all these blue ribbons, and I realized that I was pretty good at this." In February 2017, she broke the U.S. 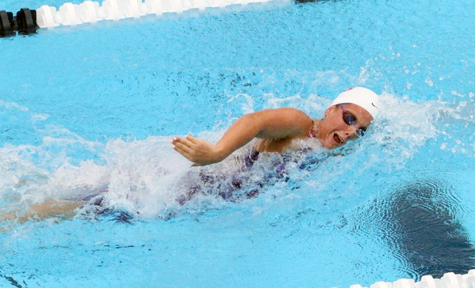 Deaf Swimming League's record of 50-yard butterfly, qualifying her for the Deaflympics. July 2017 marks Cocker's first participation in the Deaflympics (Samsun, Turkey). Although she has a waterproof CI, swimmers in Deaf-sports competitions, including Deaflympics, cannot use any kind of hearing aid or external technology during competition, to eliminate any unfair advantage. At Cal State East Bay, Cocker is majoring in Liberal Studies and minoring in Hospitality and Tourism. After graduating, she hopes to find work in one of the tate Departments, or as a flight attendant. We wish her the best—be it on land, in the air, or in the pool.